The July 27th, 1956 crash of a B-47 into a storage igloo at RAF Lakenheath continues to be the source of disinformation (along with several other Broken Arrows we will discuss in the future). One of the most common myths is that the weapons, if they had detonated, would have "turned southeast England into a desert". Well, not quite. The three Mark 6 bombs were in storage, and therefore no nuclear capsules were installed, nor stored in the building (the nuclear capsule was manually installed in the Mk 6, and only when airborne and just prior to strike) . Each Mk 6 did contain at least 5,000 pounds of high explosives, and depleted uranium. 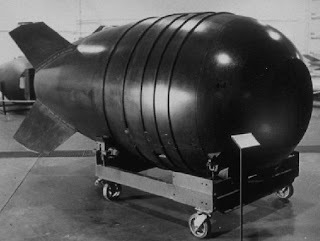 Even if the weapons detonated due to fire, there would not have been a nuclear reaction (U-238 is not fissionable through high explosive compression or fire). The former Atomic Energy Commission site at Medina, Texas is a prime example of such an accident. On November 13th, 1963, a forklift driver accidentally scraped a load of weapon components which subsequently caught fire. The resulting detonation of 123,000 pounds of HE vaporized the storage igloo and disassembled weapon components. No fatalities resulted, and the area around the Medina complex, Lackland Air Force Base, and San Antonio, Texas are not radioactive wastelands. Mark 6 fission bombs in storage did not contain material capable of a nuclear explosion. The nuclear capsules were stored in "birdcages" in a separate secure facility inside the storage area. 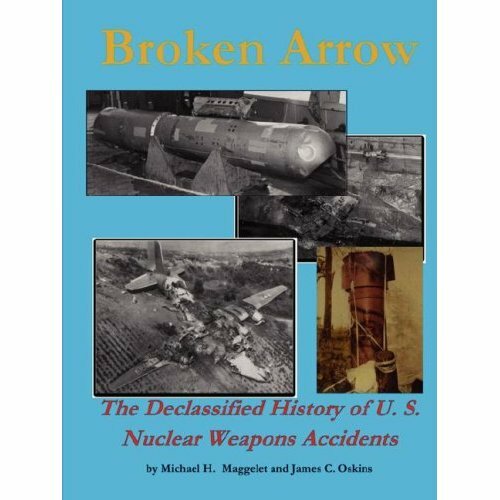 Details on the 36 known Broken Arrows can be read in "Broken Arrow, The Declassified History of U.S. Nuclear Weapons Accidents" by Michael H. Maggelet and James C. Oskins (ISBN 978-1-4357-0361-20). Our book contains copies of declassified accident reports, explosive ordnance disposal reports, and photos and drawings of accident scenes. Our books are available through Amazon.com, Books A Million, Barnes & Noble, and other fine booksellers. Michael H. Maggelet is a U.S. Air Force retiree and was a Nuclear Weapons Specialist and Team Chief from December 1980 to June 1995, He had assignments with the 509th MMS, Pease AFB, New Hampshire, 380th MMS, Plattsburgh AFB, New York, in Rheinland Pfalz, Germany, and with the 28th Maintenance Squadron at Ellsworth AFB, South Dakota. During his time in service Mike worked on the B43, B57, several mods of the B61, the B83, and the AGM-69A Short Range Attack Missile. James C. Oskins is a U.S. Air Force retiree, and was a Nuclear Specialist, a Nuclear Weapons Arming and Fusing Technician, a Nuclear Weapons Technician, and Team Chief from May 1955 to June 1975. He had assignments with the 35th Munitions Maintenance Squadron (MMS), Biggs AFB, Texas, 702nd Strategic Missile Wing, Presque Isle AFB, Maine, 11th MMS RAF Upper Heyford, England, 28th MMS Carswell AFB, Texas, 381st Strategic Missile Wing, McConnell AFB, Kansas, and 320th MMS RAF Upper Heyford, England, and 3096th Aviation Depot Squadron, Nellis AFB, Nevada. During these assignment Jim worked on the Mark 6, Mk 15, Mk 17, Mk 21, W39, Mk 15 Mod 2, Mk 28, B53, W53, B57, and B61.